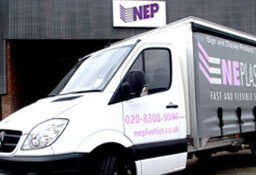 As part of our standard service we offer straight cutting at NE Plastics. With the aid of our CNC router and laser we can also cut to shape upon request. Straight cutting can include either rectangular or square panels. Cutting your materials to size is a simple process, however we require certain information before we can proceed including, the quantity of panels needed, whether there are different sizes involved and the length and width of each panel variation. To maximise your return we will always do our best to optimise the sheet to produce the best yield. When there are a small number of cuts and few panel variations are required, we usually do not charge for straight cutting. 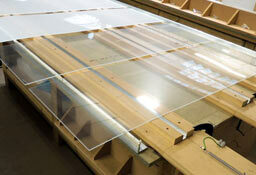 Large scale cutting requirements or multiple panel sizes may however incur a cutting charge. If you are uncertain as to whether a cutting charge will apply please contact our sales team who will be happy to advise. 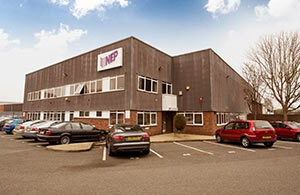 At NE Plastics we regularly cut to shape and can produce intricate designs out of a variety of our stocked materials. Although we do not design in-house, we can take our customers programmed CAD files and turn their works to life with the aid of our CNC router or laser. Shaped cutting can be as simple as a circle or as detailed and intricate as a brand logo – we leave the design and imagination in your hands. When dealing with files that are over 3MB, it may be necessary to do a FTP (File Transfer Protocol) or convert the file into a ZIP or RAR. NE Plastics can receive emails over 4MB in size, but some networks will not allow transmission of larger file sizes. In these circumstances, contact us and we will be happy to assist. As a rule we do not programme from scratch at NE Plastics however there are some instances where the request is simple enough to be processed quickly i.e. a simple circle. If this is the case we will cost any programming time into your quote. Please get in touch to see whether this is applicable for your project. 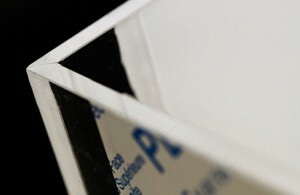 Cutting printed materials has become even easier at NE Plastics, with the aid of our new registration mark camera. The camera has the ability to identify printed material from white space and then cut to shape. Our large 3m x 2m CNC bed also allows for a wider range of printed cutting options to be available. For a visual example please follow the attached link.